Billionaire Boy tickets at King's Theatre, Glasgow. 2020. 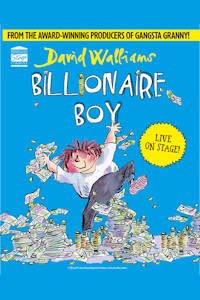 Find the best Billionaire Boy kids show tickets at King's Theatre, Glasgow. Joe Spud is twelve years old and the richest boy in the country! He has his own sports car, two crocodiles as pets and ?100,000 a week pocket money! But what Joe doesn't have is a friend. So he decides to leave his posh school and start at the local comp. But things don't go as planned for Joe and life becomes a rollercoaster as he tries find what money can't buy! From the award-winning West End producers of Gangsta Granny and Awful Auntie comes this amazing new production of David Walliams' best-selling story! Book by David Walliams. Company Birmingham Stage Company. Adapted by Neal Foster. Wednesday, 15th January 2020 to Sunday, 19th January 2020. Billionaire Boy tickets: The tabs above allow you to select between links to suppliers and date searching. Click on a supplier's logo to see their details and on the 'buy now' button to see and check the tickets on offer.